Revisit your childhood this holiday season with Mickey Mouse! As children we each grew up sitting in front of the television being entertained by the creations of Walt Disney. From the originals Bambi, Snow White and Mickey Mouse to the modern Elsa and Dory, these characters have walked along with us throughout our childhood and often stay near and dear to our hearts throughout our adulthood until we ourselves introduce them to our children. Since 1928, Mickey Mouse has entertained children and adults alike through delightful cartoons and animations. The character has long been a part of Americana when Walt Disney introduced him in the iconic Steam Boat Willy short film which gave way to the prevalent and much-loved mouse. Released from the New Zealand Mint, the Mickey through the Ages collection brings the many iterations of Mickey Mouse to life, focusing on Walt Disney’s early work with the character, leading to this festive holiday release. 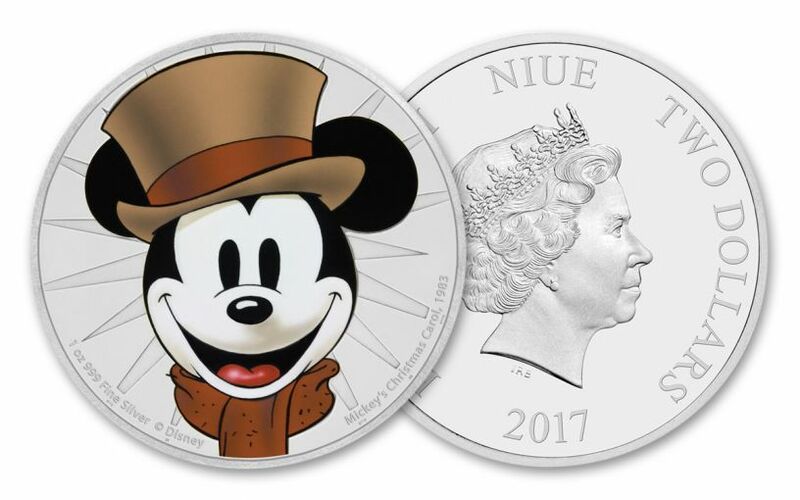 A Limited Mintage -- Only 10,000 of these 2017 1-oz 99.9% fine silver holiday themed Mickey Mouse coins will be released worldwide, making the coin an impactful addition to any collection. Featuring Disney’s Mickey’s Christmas Carol -- Mickey Mouse was recreated in a design harkening back to the original character, with this design featuring him as the clerk Bob Cratchit in the Christmas tale. Final Release in the Series! 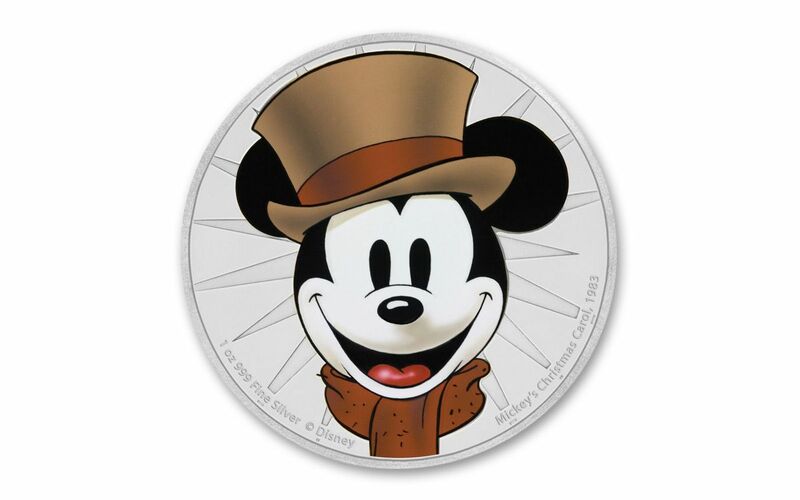 -- This Mickey Mouse coin will be the final release from the Mickey Through the Ages collection. In Ungraded Proof condition -- This coin is designated as an Ungraded Proof which entails a visually appealing proof coin. This 2017 Mickey’s Christmas Carol 1 oz. silver coin is the last coin released from the series. 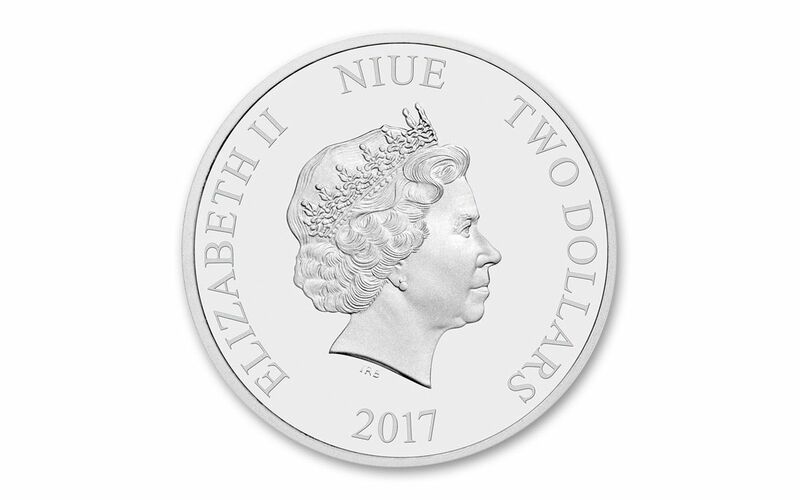 Coupled with the extremely limited mintage of just 10,000 coins struck, is sure to make this new release from the New Zealand Mint a popular and impressive addition to any collection!